As I sit here tonight, lost in thought, prayer, and song, God has touched my heart and enlightened my mind, answering deep questions that gave me great pause pondering in last night’s sleep and the light of today. These thoughts threw me into a state of perplexion, as I surely thought to myself, I have nothing to offer to the Great Glorious God and His Holy Majesty. So then, Our Lord took pity on my lowliness and reminded me, in my feeble mind which was a bundle of distressed thoughts as tears fell down my face, that God gave me everything that I am and that all He desired was that I give everything that I am back to Him as a gift. He desired my love, my faith, my trust… But, most of all, my free will, a precious, mysterious gift that I will never truly understand on this side of Heaven. And having this answer, it satisfied me somewhat to allow me to sleep. To know that God could be satisfied with so little I had to offer, because He gave me that little portion to my being and simply wanted it back. A little portion that totally belonged to Him anyways, as part of my lowliness, being a creation of His Divine Hand. But, I still continued to ponder in a hidden way the burning question… Why create me? An inferior, weak human being, when God could create others to be equal to His Divine Majesty and that of the Blessed Mother? I remembered the teachings of St. Therese Lisieux, The Little Flower, and St. Louis de Montfort on the heavenly garden of God and His Mystical Rose. I recalled prior writings where I wrote that every soul is like a beautiful flower uniquely created in the garden of God’s Love. And I also reflected upon a heavenly message from Our Lord at Holy Love Ministry (http://www.holylove.org). In the message, Jesus revealed that He presents the souls who have reached the highest pinnacle of holiness as sweet flowers of consolation at the foot of Our Lady in Heaven, as many slip to perdition. And so, I began to think about these deep thoughts imparted to me, about the heavenly garden of God and how every soul is like a “gift” to Our Blessed Mother, when suddenly, the darkness parted to the fullness of light in my mind’s small intellect. And it has become a great joy to me now, knowing that I finally understand fully one of the reasons why I was created. Why me, a lowly speck of nothing, in comparison to the Great Glory of Our Lord and Our Beautiful Queen, was created by the Divine Hand of God. Yes, “all things are possible” to God. Yes, God could create a family of beings equal in superiority and greatness and glory to Our Beloved Mother. A super family that I thought to myself would be worthy of the Majesty of The Holy Triune God. “At that moment I experienced the freedom of my will. I experienced God as the great respecter of the human persons whom he creates. I realized that God waited upon me. He knocked but he did not open. He invited but he did not compel. He who is almighty would not act. He would wait. It was as if all the centuries were contained in that single moment, as if all of history, from Adam and Eve to Jesus’ Final Coming, was suspended, held in midair. In my own heart, it was like years, all the years and all the moments that I had experienced God’s delights. Now, I realized God was my suitor. He wanted my hand in marriage and my womb to bring forth his Son. How could I refuse him? How could any creature say “No”? My whole being poured forth into God. I was united to God as I had never been before. The divine fire overshadowed me. “Let it be done” I said. I repeated this over and again, as if once was not worthy enough of his Being. And upon looking closer at this locution, I realized the True Greatness of Our Lady. Her suitor was God, Whom desired Her hand in marriage and Her Immaculate Womb for His Divine Son. Our Lady is The Queen of Heaven. She is the Glory of God. She is the Most Beloved First Daughter of God The Father, The Ever-Holy Mother of God The Son, and The Most Cherished Spouse Of God The Holy Spirit. For I realized that to create beings equal to the Blessed Mother would serve no purpose, because there can be only one Queen of Heaven. It is a singular, unique grace particular to Our Lady alone. Yes, we, as part of the human family and being created in the image and likeness of God, are called to imitate the inner beauty and holiness of the Three Divine Persons and Our Lady. But, there can only be one Queen worthy to bring forth the One Divine Son in Her Immaculate Womb. There is only One True God, Born of the Flesh. And in the realization of this divine mystery, I finally realized one of the eternal reasons for who I am and why I exist. I realized an important reason as to why I was created. I exist to be an eternal gift of love from God to Our Lady. And Our Lady is a Great Gift of God to us as we become children of Our Blessed Mother at the Cross. Yes, it is true. God did not need to create humanity and the angels. God did not need to create Creation at all. 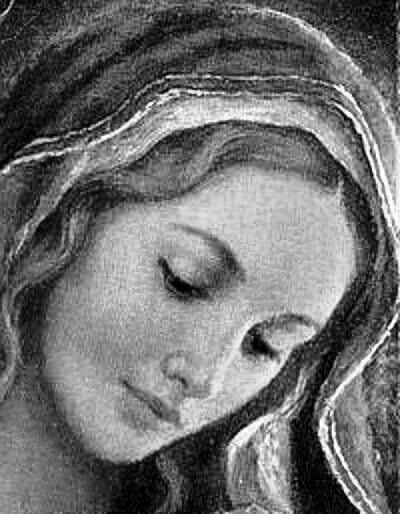 God could have simply created the Blessed Mother and stopped at that single ultimate glorious masterpiece of His Divine Hand. Our Lady Is Perfect in every way and Our Lord did not need to create anything else to bring about the Desires of His Most Divine Heart—a Daughter, a Mother, and a Spouse. But, God did not stop with the Desire of His Most Sacred Heart for Our Lady. Our Lord, having Our Lady ever-foremost in His Divine Mind, desired to create all of Creation as a Great Gift of Love to romance the Woman of His Most Divine Heart. And the human family would be the pinnacle of Creation, each person made in the image and likeness of God, but also, in the image and likeness of Our Lady, with the angels, as helpers to man. Humanity and the angels would be the treasured gifts of eternal love from God to Our Lady. Above all natural Creation, our souls would be the ones only truly worthy of presenting as acceptable gifts to Our Queen from His Most Sacred Heart. Every human soul is a heavenly flower, a mystical rose, in God’s Garden. Every human soul is an ever-beautiful, ever-blooming bouquet of love that Our Lord, the Eternal Bridegroom, presents to His Heavenly Bride. Every human being and every angel reflects some aspect of beauty and holiness that exists chiefly and firstly in the person of Our Lady. Each of us magnifies a special, unique quality and beauty of Our Lady, and through our continual love of God and neighbor as ourselves, we put on display a special character and attribute of Divine Love that is expressed firstly between Our Lady and Our Lord for each other. I was created to be a gift of love. An eternal gift of holy love given by Our Lord to Our Lady. An eternal gift, imitating an aspect of the exchange of Love between Our Lord and Our Lady, through my very state of being. Each of us in heaven enjoys a unique intimate relationship with Our Lady. Second only to God Himself, each of us is ever-closest and ever-present to Our Lady in a fullness more profound and in a deeper way that is set apart from the unity that all holy angels and saints have in the Communion of The Saints through The Body of Christ. In order to comprehend this profound and deeply intimate relationship we have especially with Our Lady, one must understand the Divine Truth that the Most Sacred Heart of Our Lord Jesus Christ and the Immaculate Heart of Our Lady are so United as to be essentially One in God. They are identical Twin Hearts never separate or apart from one another. Wherever Our Lord Is, so Is Our Lady. They never walk apart or alone. Our Lady is Our Mediatrix of All Grace and Our Advocate of All Causes. And so, because of the unique Unity between the Twin Hearts of Divine and Holy Love, each of us has a uniquely profound communion with Our Lady. She is ever-present to us, just as Her Son, Jesus, Is to us in heaven. Also, I have learned in my ponderings, that it is through our familiar and intimate relationship with Our Lady, that our loving relationship with God The Holy Spirit is made more immediate and accessible to us. And so, as Jesus has revealed, God The Holy Spirit has His permanent residence in the Immaculate Heart of Our Lady. He exists there in an overabundant fullness that is unlike His presence in all other creatures. To honor the Immaculate Heart of Our Lady, is in reality to adore and praise The Holy Spirit Who abides there completely and fully. And to understand the richness and greatness of His Divine Person, it is necessary to understand the profound and intimate relationship The Holy Spirit has and shares with Our Lady, Who Is His Chosen Spouse. It is in studying the divine and holy intimacy between The Holy Spirit and Our Lady, that we grow in our understandings of the inner mysteries and workings of The Most Holy Trinity. This is why The Age of Mary will be also known as The Age of The Holy Spirit. They are One, as in marriage, One Flesh, One Spirit in Divine Intimacy. To understand Mary is to understand The Holy Spirit. All Glory to God! God’s chosen inner world—Our Lady—as otherwise known as The Immaculata, is a world unknown to us on earth. But, in the age to come, God will reveal more of this ever-holy, ever-beautiful, ever-exquisite world to us as we become ever-closer to knowing Our Lord, The Holy Spirit. In the Immaculate Heart of Our Lady dwells the fullness of Divine Infinite Love. The Blessed Mother has shared in heavenly messages that our human hearts are created to hold the Infinite Love of God. And so, when mankind seeks the finite, empty goods of the earth, it creates a deep gnawing and profound emptiness and void in the human heart, which was always meant to hold the richness of God’s Love. Nothing can replace the Infinite Love of God that is meant to reside in the human heart and soul. Our Lady has said that She knows all the powers of The Holy Spirit, because She has experienced them all. How profound this statement is! As it is a great mystery how Infinite Love can reside in the finite human heart and soul. It is a mystery that cannot be understood on this side of eternity. And yet, we are invited by God to share in the participation of His Divine Life by having a portion of His Infinite Love dwell in our hearts and souls. A complete fullness that Our Lady experiences and has been given the authority to impart to us as Our Mediatrix of Grace. We are called to live in Infinite Love. And in the age to come, we will have an eternity to explore, learn and grow in this Love, as we become closer to God through the Immaculate Heart of Our Lady. And so, I started this writing by sharing that we are eternal gifts of love from Our Lord to Our Lady. The Blessed Mother was given to us as a great gift from the Most Sacred Heart of Our Lord at The Cross. In turn, each of us was given to the Blessed Mother as a gift of being Her own children and children of God at The Cross. A mutual exchange of gifts of holy love. But, this exchange of gifts of holy love was not simply a one-time event. No, rather, we have a special calling to manifest our holy love of God and Our Lady for all eternity. In imitation of how God and Our Lady loves individually each of us. The gift of holy love is forever life-giving and forever fruitful in the Light of God. And so, each of us is an ever-special beautiful rose for Our Lady. As each of us grow in holiness, virtues, and love, we showcase a special attribute of the Infinite Love in God, blooming ever-so lovelier in the eyes of Our Lady. In our own unique way, we are a special delight to Our Lady, which She will forever cherish, joined to us in a special, intimate way for all eternity. We will love Her, and She will love us, as we enjoy and praise God and all of His Mysteries held in Creation forever. I have learned through the Holy Love messages that in the age to come, that not only will the heavenly messages of Holy and Divine Love be accepted and understood by humanity, but that all of mankind will be learning further about the inner workings of the Most Holy Trinity. We will spend eternity learning and growing in Infinite Love, which has been supported by the lessons imparted in Locutions To The World. The spiritual journey through The Most Sacred Chambers of The United Hearts of The Most Holy Trinity and The Immaculate Heart of Our Lady, as provided for at Holy Love Ministry, will be embarked by every good soul—as each soul matures in their spirituality and in their love of God. Finally, the meaning of Creation, of all the angels and the human family makes sense. Finally, the meaning of my own creation makes sense and comes to rich fullness and divine life. I have a sublime eternal purpose. I am special, I am unique, I am irreplaceable, and I am infinitely loved.